Perhaps it was "in protective custody", the terminology was never quite clear. I was a student supposed to be on a flight out of Prague heading home, but the Soviet invasion of Czechoslovakia had occurred the night before. As it was occurring, I and my fellow-traveler students were fairly well inebriated and trying to find our way back to our hotel after midnight on the unfamiliar trolley system. We were all well below the legal drinking age in the US, but we weren't in the US, and as students, American students, it was impossible to say "no" to the drinks offered us. Eastern Europe was gray during the summer of 1968. In Hungary, Poland, Russia, the people had all been friendly to us in their own way, but were all gray -- their clothes were gray, buildings gray, their attitude was gray. Czechoslovakia was different, full of color during the Prague Spring. The people were happy, optimistic. They wore colored clothes, there were decorations all about. And those Czechs loved Americans. The restaurant waiters kept saying, "You're going home to America tomorrow? Have a beer on us!" So we did, into the night. It's great to be liked by strangers. When we finally headed back to the hotel helicopters and airplanes were flying by low overhead, but we paid them no mind as we tried to find our stop on the edge of the city in the dark. We finally found it, just before turning around to go back looking the other way. That next morning we had to get up early to catch our flight, and ... oh, god, all the noise ... it sounded like there were tanks going by under the window. One of us looked out it and reported, "There are tanks going by under the window." That didn't have a real big impact on us at first. We'd been traveling through Eastern Europe and the Soviet Union all summer, and that was a militarist world, we'd seen military vehicles and trains everywhere. Our first thought was just, well, the Czechs are running some tanks down their street the first thing in the morning. But pretty quickly we realized it wasn't just "some" tanks, there was a bigger deal going on. It wasn't immediately obvious that the tanks were Soviet, they didn't have the big red star on them that you always see in the movies, their only markings were white "invasion stripes". But our slowly awakening minds soon got around to realizing what they were -- we had been studying all things Soviet all summer, including how the Warsaw Pact operated. It was impressive how much heavy equipment the Russians had gotten to the capital city so quickly. And as the self-centered teenage male mind works (with something of a hangover) our first deduction from that was: "well, no rush, we're not going out through the airport today, we can take it easy". And we did, for a bit. But even the self-centered teenage male mind can recognize history being made, and after taking just a little more rest time we were out and down from our room trying to see what was going on. It's a strange thing to live through somebody else's nightmare. The hotel staff and restaurant waiters were ashen. There were tanks, "enemy" tanks, going by right outside their windows at eye level. A nation was being invaded, crushed. You could read it on the faces of the people. But as Americans, we had immunity. We had complete sympathy and empathy for the people of Prague -- but also had "experience an invasion free!" cards. So it was out into the streets for us, to see what was happening. My memories of that are kind of jumbled. There wasn't any armed or physical resistance near us. Mostly crowds and confusion. Russian soldiers, who didn't seem particularly well educated or trained, said they were there "defending" the Czechs from ... oh, Germans, or somebody. They didn't have the attitude of being invaders or seem to be looking to crush resistance. (We later learned the invasion forces had been told they were acting to help the Czechs, and that they were quickly rotated out and replaced before their realization that it wasn't true had any consequences.) We talked to as many people, and as many Russians as we could, and with our Kodak Instamatic cameras took pictures of everything in sight. Then it was back to the hotel for lunch, because even during an invasion teenagers have to eat. The menu had suddenly become much more sparse, as those running the restaurant didn't know when they were going to eat again. That was OK with us, we were still trying to figure out what was going on. I mean, we didn't know. There was no Internet, no radio, no working phones. Was the Cold War getting warm? Was a real war starting? We had no idea. There was a lot more troop movement, convoys running right by the hotel. It was on a road that ran straight into the city from out by the airport, and the road was getting heavy use. And Old-European city road, there was no real sidewalk, the convoys were running right next to the building. We went back to our third-floor rooms and hung out the windows, literally, taking pictures of everything. We could take pictures straight down. When half-tracks went by carrying troops, armored on the side but open on top, we took pictures straight down of the soldiers inside. This made some of them nervous, as they remembered that during their invasion of Hungary in 1956 people who hung out windows sometimes dropped Molatov cocktails on them, and they raised their guns at us. We'd go back inside. That evening was one of great uncertainty, nobody knew what was going on. Frankly, apart from that, I don't remember much about it. But the next morning the Soviet army arrived at the hotel. They were there to "confine" us, "protect" us, whatever, translations were uncertain -- but they did not want Americans out on the streets talking to people and taking pictures, that much was very clear. They also did not want Americans going home with the pictures they undoubtedly had already taken. So the word went out, we were all going to be searched, and our rooms searched, all film was to be confiscated. Fat chance! All the film of the invasion immediately went into the linings of our coats and every other place that innovative teenagers who'd spent years watching James Bond movies and "I Spy" and "Man from U.N.C.L.E." could think of hiding it. We all had plenty of other film from our summer of travel that we balefully spread across our beds to be seized as the Soviet soldiers came room to room. The soldiers didn't get a single roll of "real" film from any of us. When they threw an overcoat to the side and it rattled and clanked from all the film cartridges and canisters in the lining, they didn't have a clue. Well, it was all staying inside the hotel after that. Somebody dug up a short-wave radio, and it told us stories such as China had given Russia an ultimatum to pull out of Czechoslovakia or else ... West Germany and NATO were mobilizing to "war" status ... we had no idea whether we were sitting at ground zero of World War III. To shrink the rest of the story to fit into a blog post, a couple days later a message came from the American embassy: "Get to the railroad station, now." There was a train about to leave to, well, we weren't sure where. But no matter, we were following instructions on this one. We ran to the station on foot leaving whatever heavy luggage we had behind. The train was the old classic steam engine pulling cars of passenger compartments, just like in old espionage movies such as The Third Man. It steamed on all night, with us not knowing really where it was going. There were strangers on the train, all come together with their own different stories. It was romantic and exciting, just like in the old spy novels and movies, only real life. I met a girl who chose to share a compartment with me for the trip (did I mention "romantic and exciting"?) not realizing how young I was ... unfortunately, I was too young to know what to do about it. Sometime after midnight we got to a border crossing, with rows of high fences, barbed wire, towers, search lights, the lot. The guards were Czechs and seemed very nervous, I wasn't sure what the story was, but it seemed like the Russians hadn't gotten there yet but were expected any moment. They seemingly let us through as quickly as they could. The next morning the steam engine pulled us all into ... Vienna. (Dang, it really was The Third Man.) The press was all over as we pulled into the train platform. "Pictures! We'll buy photos! ", pushing microphones at the compartment doors, just exactly like in the old movies. I had to go to a Post Office and wait in line for an hour to make a phone call home to tell my parents I was OK. They didn't know that I wasn't dead. But they were both out when I called, so I left a message at my father's office. A little while later we all flew a nice new 707 back home. But watching those tanks crush a nation maybe gave me some lasting perspective on politics and international relations that my fellow teenagers who only enjoyed the Summer of Love never got. 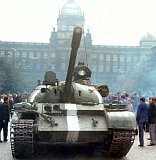 a recent poll found that 70 per cent of Czechs younger than 20 have 'no opinion' on the events of 1968. I don't know about that, but I do know some 20-odd-year-old children of the former East Germany who spent their first dozen or so years of their lives in it, who do seem fairly oblivious to the pre-1989 world of Communism that they and their parents lived in. Their parents certainly remember, but say they don't want to burden their children by dropping all that on them.